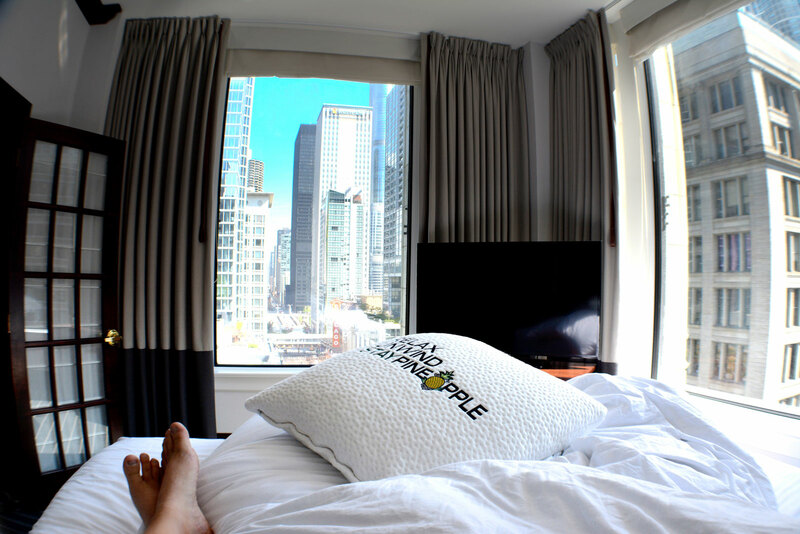 Super fuzzy slippers, comfy robes, and individual duvets are just a few of the amenities that The Alise Hotel in Chicago offers. The centrally located boutique hotel in downtown is the perfect mix of architecture and entertainment. I can’t even count the number of times I walked by this place. I knew it was a city landmark and from time to time, I looked inside to admire the architectural details in the lobby and its restaurant Atwood on the first floor. One of the most highlighted facts about this property is not the fact that it was one of the first buildings to offer electricity and a phone on every floor, but all of the stories around Al Capone’s dentist, “Dr. Frank,” in room 809—think teeth cleaning and some other illicit things happening. Check in was fast and easy. When we arrived we had some great tasting cupcakes and fruit infused water in the lobby. 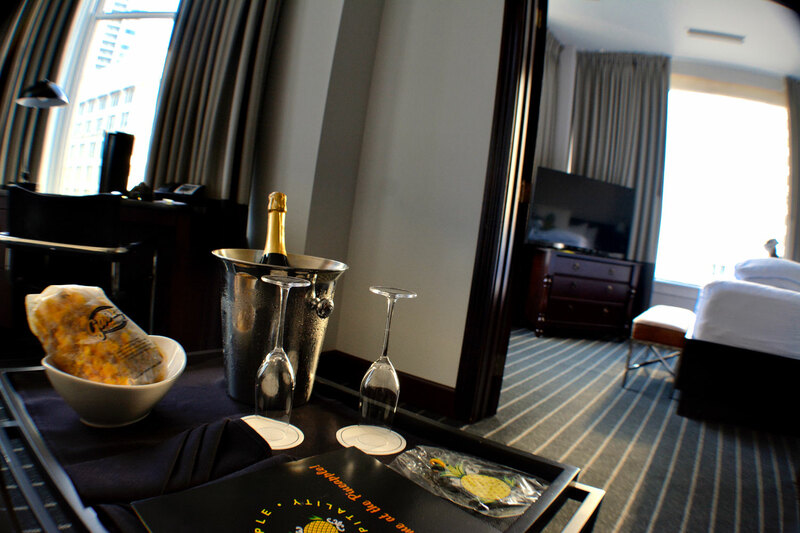 The journey from the elevator lobby to my room was the perfect balance of a late 1920’s Chicago and modern amenities. The interior facade by the elevators was covered with ornate metal frames. Most floors still have the original heavy wooden doors with Florentine glass panels that once were used as office space for merchants when the building was erected. Forget keycards as the door hardware is still in place—and a real key opens the door to your room. Another detail not to miss is the door mail slot and floor mosaics by the staircase. The rooms, modern furniture is simple yet elegant as a continuation of what the hotel history highlights. My bed was the best, I had a perfect view of the Chicago Theater lit up at night and a glimpse of Millennium Park to my right. The Alise Chicago takes your bedding to the next level with a “Naked Experience” by adding super fuzzy slippers, comfy robes, and Individual duvets—so no fighting at night on who gets it. It is almost the ideal location for a stay in the city. Everything was within walking distance including shopping, nightlife, Broadway shows, dining and Millennium Park. 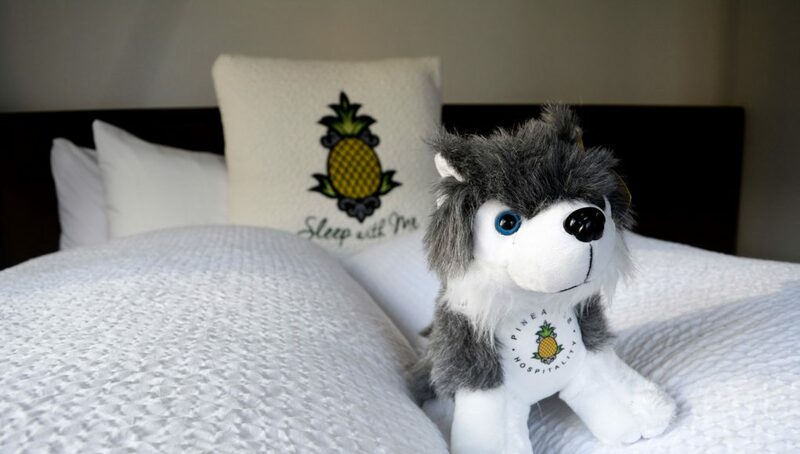 So “staypineapple” during your next stop in Chicago. Next article24 Hours in Galena, Illinois – What Do I Do?